If two different business men approached you asking for support in their plan to take over an ailing village pub, which one would you select? A famous TV celebrity chef or a chap who had run a building company with no experience of the hospitality trade? Bit of a no-brainer? Well you would be dead wrong. Marco Pierre-White took over the Black Boy in Milton. He took out most of the bar; made the small remaining bar area as uncomfortable as possible and took lager off draught. The locals voted with their feet and the smart set from London failed to materialise. He filled it with the strangest collection of objects and this poor old empty pub just looked and felt sad. 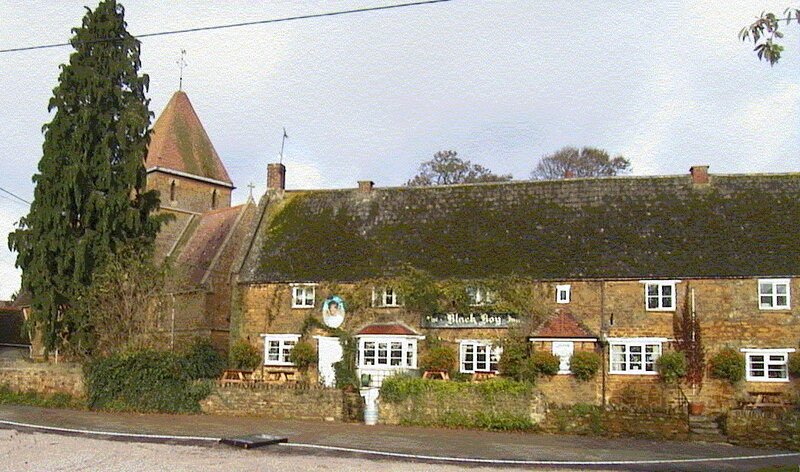 Milton has about 150 residents and just a small church next to the pub so they feared for the future of their village pub. Then, along came Pete Strickland who bought the Black Boy with his wife Cath and his son who is a chef. Pete and family have turned the Black Boy back to what it was and always should have been – a village pub where you can enjoy a good drink and a good meal and that attracts customers from the village and from further afield. It is regularly bustling with people. They encourage dogs (v good) and children (OK if they are seen and not heard!) but I fear family friendly is an important part of success in the trade today. So, if you had betted on Marco Pierre-White to make a success of the Black Boy, you would have been dead wrong and if you thought a newcomer ex-builder would flop you would have been just as wrong. The Black Boy is a great local and bucking the trend of struggling local pubs. I recommend it highly. This entry was posted in Local and tagged Black Boy Milton, Marco Pierre White. Bookmark the permalink.